Pinterest is old news. Yeah, we know. Everyone seems to be enamored with the platform, and for the longest time, we couldn't understand why. Of course, we saw the value in using Pinterest in your everyday life - who wouldn't want an online recipe box, holiday gift guide, home decor inspiration, travel ideas and collage of cute puppies? As B2B marketers, it didn't seem like a good fit. The community on Pinterest, over 12 million, is growing everyday. Like any social site, using Pinterest for B2b marketing can provide a wealth of opportunity. It's a place where you can share images that relate to your company - show a behind the scenes look at your office, showcase a portfolio of your best work, or promote your blog posts. We've all heard the saying, "A Picture is Worth 1,000 Words", and it's true. Capitalize on the fact that people enjoy pictures, and promote your brand! It seems at the moment, the B2B community on Pinterest is slim. Of course, the giants of the industry are there with lots of followers, but us smaller brands have an opportunity to position ourselves as leaders in our space. It might seem the lack in community is a negative, but quite the contrary. Take advantage of the low numbers now - create content that is unique to your company and that positions your company as an expert in your field - as the community continues to grow, you'll already be established. Your brand will be propelled to the top of the pack. You can kind of look at Pinterest as a hub of backlinks to your site. Each image that is pinned (or re-pinned) from your site, will link directly to the page it was pinned from (meaning your website). We view the power of Pinterest for B2B marketing as just another way to drive potential customers to your site. If you have offers or call to actions on your website or blog, pin the associated image (like the cover of your newest ebook), so users will be taken directly to that offer page, increasing your conversions. That's the short of it. As we continue to explore the platform, we will share how it's working for us. 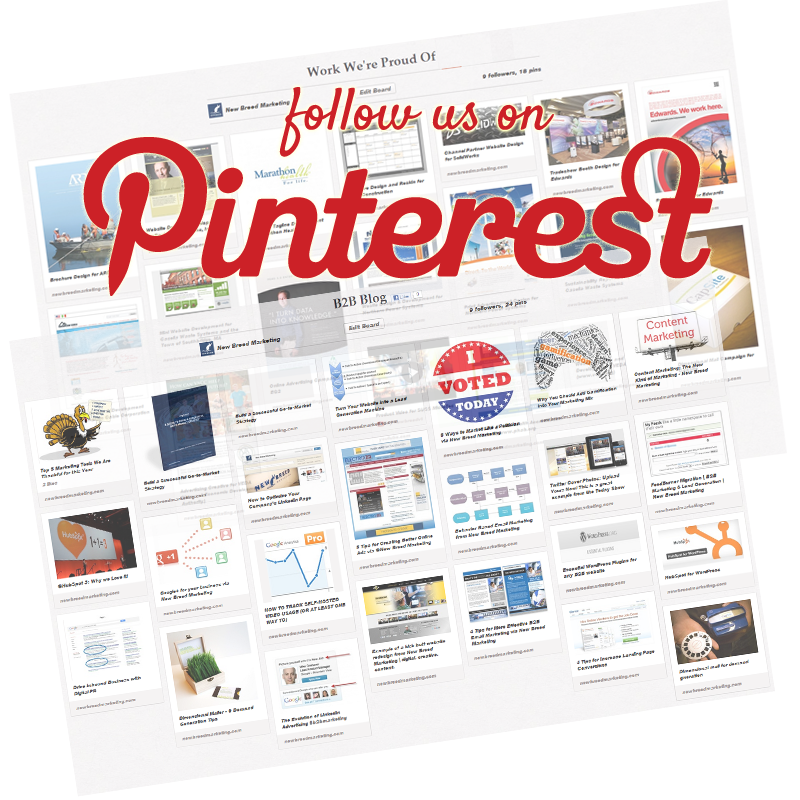 In the meantime, follow us on Pinterest and see how pin-happy we are.